Benedict Cumberbatch, Keira Knightley and Matthew Goode star in the WWII thriller The Imitation Game, based on the book Alan Turing: The Enigma by Andrew Hodges. Watch the movie trailer below. English mathematician and logician Alan Turing, helps crack the German Enigma code during World War II. MPAA Rating: PG-13 for some sexual references, mature thematic material and historical smoking. “The Imitation Game” is a dramatic portrayal of the life and work of one of Britain’s most extraordinary unsung heroes, Alan Turing. 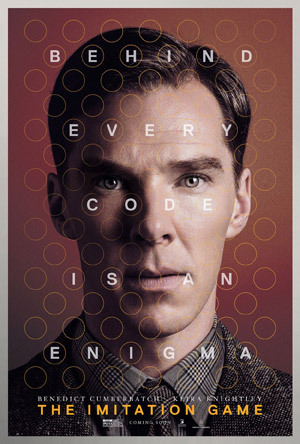 The pioneer of modern-day computing, Turing is credited with cracking the German Enigma code and the film is a nail-biting race against time by Turing and his brilliant team at Britain’s top-secret code-breaking centre, Bletchley Park, during the darkest days of World War II. Turing, whose contributions and genius significantly shortened the war, saving thousands of lives, was the eventual victim of an unenlightened British Establishment, but his work and legacy live on. Based on the book “Alan Turing: The Enigma” by Andrew Hodges.